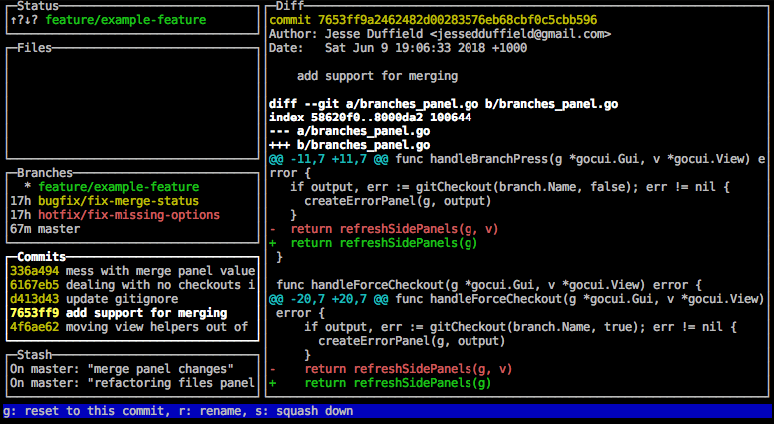 A simple terminal UI for git commands, written in Go with the gocui library. Are YOU tired of typing every git command directly into the terminal, but you're too stubborn to use Sourcetree because you'll never forgive Atlassian for making Jira? This is the app for you! Packages for Ubuntu 16.04, 18.04 and 18.10 are available via Launchpad PPA. Built from git tags. Supposed to be more stable. Built from master branch once in 24 hours (or more sometimes). Packages for Arch Linux are available via AUR (Arch User Repository). There are two packages. The stable one which is built with the latest release and the git version which builds from the most recent commit. You can download a binary release here. Please note: If you get an error claiming that lazygit cannot be found or is not defined, you may need to add ~/go/bin to your $PATH (MacOS/Linux), or %HOME%\go\bin (Windows). Not to be mistaked for C:\Go\bin (which is for Go's own binaries, not apps like Lazygit). 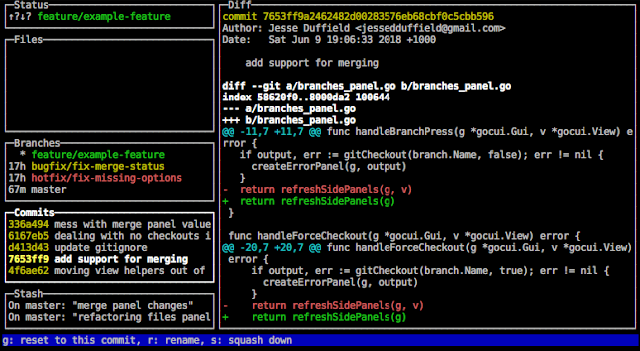 Call lazygit in your terminal inside a git repository. If you want, you can also add an alias for this with echo "alias lg='lazygit'" >> ~/.zshrc (or whichever rc file you're using).